Lijun is a leading dancer & instructor that is best known for its high quality teaching of Chinese classical, ethnic and modern dance in and around London. 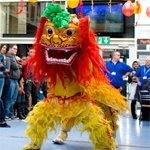 Apart from teaching, Lijun offers new and fresh choreography for spectacular shows in major culture events in the UK throughout the year. Her classes and dance workshops are conducted in her Studio and they focus on performance, enjoyment and dance training. All her classes provide a place for students of all ages and of all abilities to keep fit, get inspired and challenge the body and mind via dancing. The studio aims to spread interest and raise the profile of Chinese performing arts and culture in the UK.